The Intervention Tool for Learning Disability Subtypes provides a brief, on-screen intelligent correlation and conclusions about a particular child's performance on detailed ability tests. A practitioner need only answer a few yes/no questions; with each, the model showing the most likely subtypes changes before their eyes. In the start of this project, I recognized that the domain scientists were building a one-off model. If it was not accepted by the market, this would matter little. If it succeeded, others like it would need to be built. Connecting the domain scientist and engineering architect, I facilitated and translated between them toward the design and build of a repeatable, reusable data model, database structure, and design language. This effort had an enduring collateral effect: development of deep-level expertise on both sides of the aisle. You will now hear engineers routinely mention learning disabilities, while domain scientists calmly talking about abstracting variables and data models. This capability for multiple reuses inspired new products and possibilities along with an existing capability to build them quickly and robustly. Quickly relating detailed information and overlapping diagnoses resulted in fast and simple answers for each child's unique disabilities. The interactive visual model refined with each click before the eyes staid psychologists who gushed, "It works perfectly!" and "We love it!" Bargaining for more time up front resulted in a project reuses of the software and database within 18 months. This took an initial investment of $70,000 and parlayed it into new product short-term savings of $200,000. It opened rapid development of similar new products at low cost. As designers with market savvy, we recognized the potential of the tool as a future stand-alone product. Allowing the graphic artist free rein to create a style and visual language to convey a sharp, futuristic tool had the sales team reporting back rave reviews from the first day it debuted. Helping engineers and domain scientists create abstracted data variables and a relational database resulted in a repeatable, reusable data model, and database structure. Visuals targeted to convey a futuristic feel resulted in a design language for other intelligence tools. In design studio, I facilitated and documented the intersection of two brilliant, but disparate minds: the domain scientist, and the engineer. The meeting of great minds resulted in a reusable data model and flexible database design. We took an early prototype to user testing. 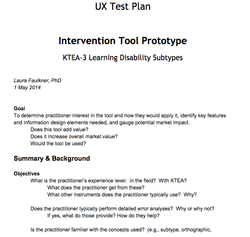 Facilitating agreed goals and areas of inquiry unique to this market test product, supported buy-in and a thoughtful test plan. UX, Product Management, and Marketing worked together to gather and analyze qualitative and quantitative results. We came out with a simpler design. 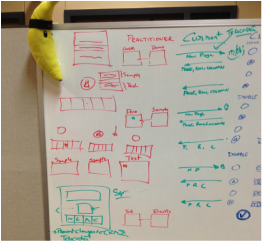 A market test product was an ideal opportunity to let the visual designer loose from our typical design language. The team provided goals to convey this as a "smart tool" and something wholly new in the field. The futuristic, interactive design brought an intake of delighted breath. The combined result of backend sophistication and front-end beauty and function elicited from practitioners, "We love it!"